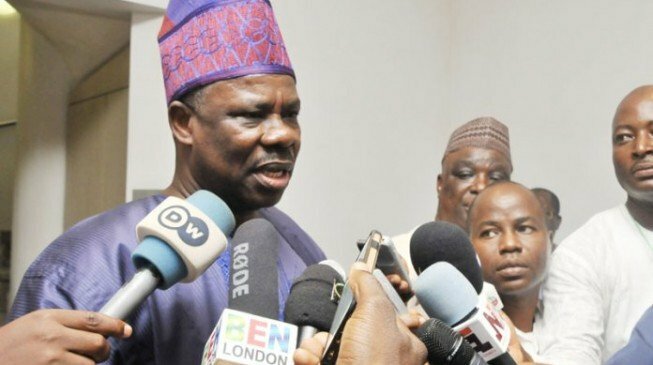 Ibikunle Amosun, governor of Ogun state, has promised to help the Nigerian Immigration Service (NIS) fight the menace of illegal aliens. Amosun said this, on Friday, when he hosted Oluwatoba Bayeroju, new comptroller of the service in Ogun, at his office in Oke Mosan, Abeokuta. “Due to our status as the most industrialised state in Nigeria, I am aware that we are prone to the infiltration of illegal aliens. Some of them are here working for some companies within Ogun State,” a statement signed by Adejuwon Soyinka, senior special assistant (media) to the governor, read. “Some of these companies don’t correctly declare the number and or status of the foreigners within their organization in order to evade tax payment. The governor advised Bayeroju to provide data showing the number of Nigerians applying for their travel passports at the Ogun office of the NIS, saying that it will help in making a case for an expansion of the passport issuing facilities in the state. “Again because of our status as the industrial hub of Nigeria as well as our proximity to Lagos, what you find is that the number of people processing their passport in the Ogun state command has risen tremendously thereby placing the facilities here under a lot of pressure. Bayeroju commended the governor, saying Ogun has been transformed in the last five years that he came on board. “I left this state 25 years ago as a young officer. Now I am back as state comptroller and I can barely make my way around because the whole place has been transformed within the last five years,” he said. He said some of the challenges facing the Ogun state command of the NIS were influx of illegal aliens, need for offices in all LGs and LCDAs and inadequate booklets for the production of Nigerian passports.